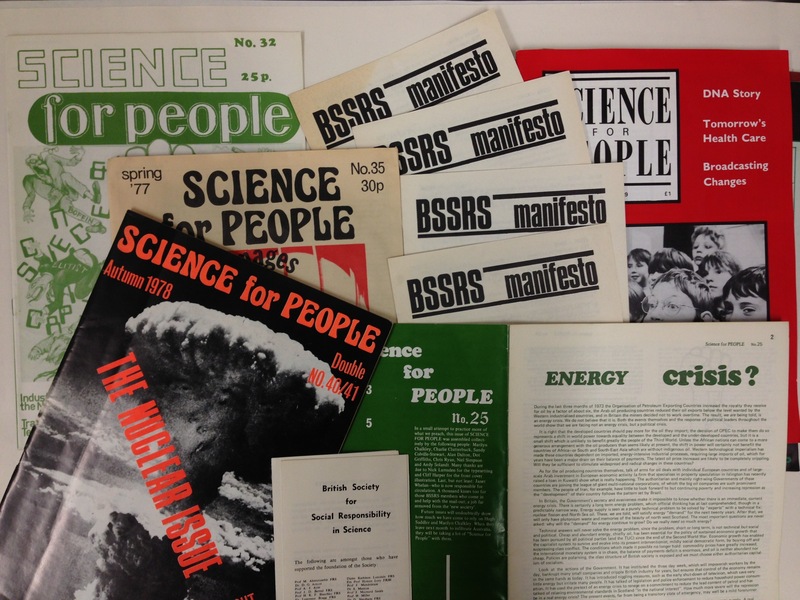 Last month, I chaired an event on science communication and political divides at the Biochemical Society. Within all kinds of science communication, not just the stuff you think is controversial [e.g. climate change, GMOs] there is a big political divide and that political divide is between the people who cheer-lead for science and the people who attempt to open up scientific institutions, open up scientific processes, open up scientists to listen rather than just to speak up on behalf of themselves. The reason we have this tension is that the money is mostly in cheerleading, the money is mostly in pushing science forward and saying isn’t science wonderful. The money is mostly in encouraging children to become scientists, it’s mostly on PR for science. There isn’t a lot of money in challenging science. Steve finished his piece by stressing he had no problem with cheerleading existing, he just wanted other work to happen too, and added a warning “just be careful who you are cheerleading for”. Steve had started by arguing against the idea that everyone in science communication necessarily shares the same values: BAE systems sponsor the Big Bang Fair, so does everyone involved in Big Bang share the values of BAE? This entry was posted in climate, events, podcasts, science and tagged events, journalism, podcasts, public engagement, science, science media on June 6, 2012 by alice. The Big Bang Fair, a big science and engineering event for schoolkids was held in Birmingham last month. Led by Engineering UK and supported by various government departments, charities, learned societies and businesses, it’s an annual event that’s been going for a while. They seem to have taken down the list of 2012 sponsors, but you can see a list of the 2011 ones in this leaflet (pdf), which included BAE Systems, Shell, EDF Energy and Sellafield Ltd. Seeing as some of these firms are perhaps only too expert in making extremely big bangs, it’s upset a few people. Check out the BAE wikipedia entry, ‘products’ subheading if you don’t get why. Anne Schulthess from CND happened to be at another education show in Birmingham that week and spotting the Big Bang, dropped in. She shared some photos, noting “basically it’s the arms fair for children. 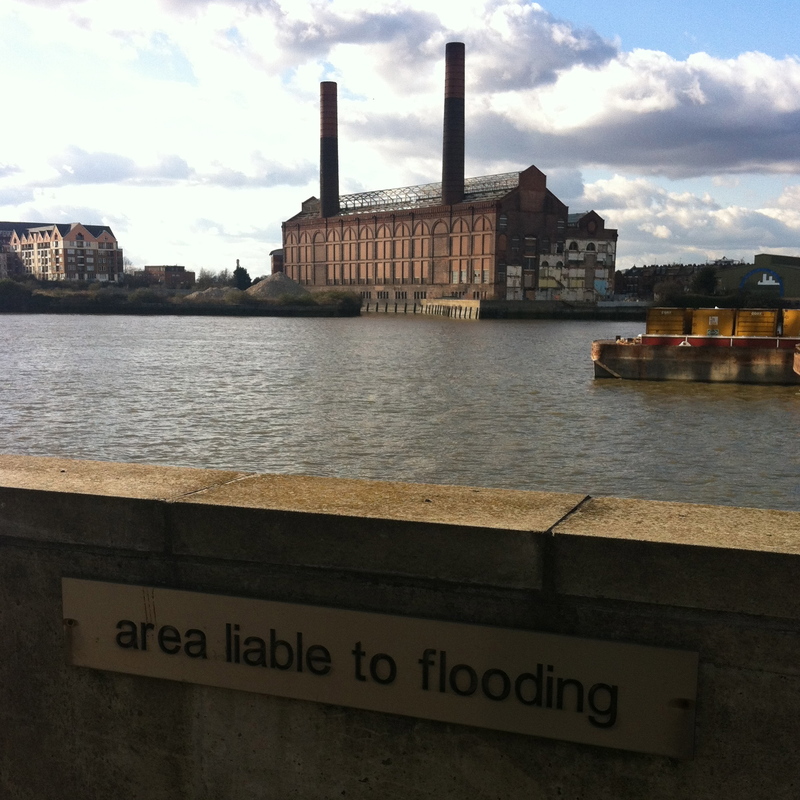 With a bit of environmental destruction thrown in for good measure”. Back in 2009, Scientists for Global Responsibility and the Campaign Against the Arms Trade condemned BAE’s role in the event (SGR/CAAT press release, reproduced on my old blog). I’d be tempted to suggest one of these groups try to set up a stall at the fair next year but even if Engineering UK let them, the £20,000 to £100,000 pricetag might well be out of the budget of a small NGO. 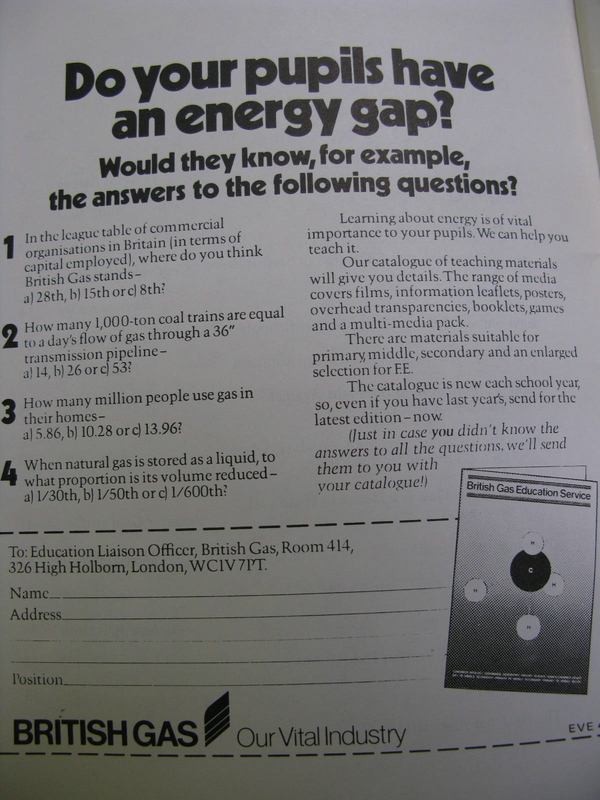 The Science Museum have a fair bit of history here: from the BNFL sponsored atomic gallery in the 1980s to Shell sponsorship of their climate gallery in 2010 (see also this 2008 freedom of information request on Shell and BP funding). 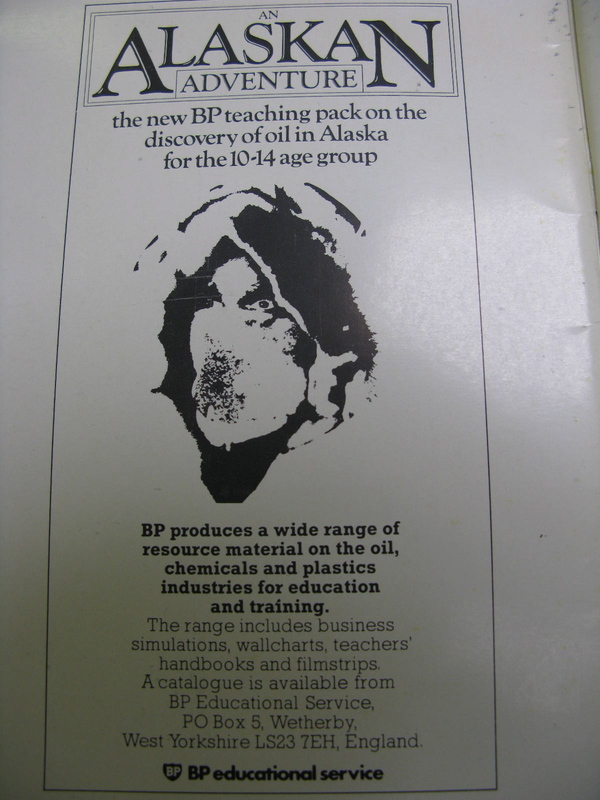 I used to work on their Energy gallery, and it’d be depressing to watch visitors clock the BP logo, laugh and walk away. I worry when I see reports that the Smithsonian were so pleased to have secured a sponsor that was ok with the idea of evolution that they let a bit of not very scientific attitude to climate change in (e.g. see ThinkProgress, 2010). I also worry when I hear about teaching resources designed to stress the uncertainty of climate change (e.g. see Guardian, 2012). I can see why groups like Liberate Tate focus on the corporate sponsorship of art and Greenpeace scale the National Gallery, but I worry slightly more about the involvement of the oil industry in exhibitions where their work is an actual topic in the content. We should be careful of simply assuming corporate sponsorship means they have influence on content. Science Museum staff claim editorial independence from any of their sponsors. Just as, I noticed, the Guardian stresses Greenpeace had no say over editorial content of John Vidal’s report on industrial fishing in West Africa, even though the NGO paid his travel costs to Senegal. We should also recognise that there is a lot of scientific expertise in industry, just as Greenpeace give Vidal access to places he wouldn’t otherwise see. Science isn’t just a matter of what goes on in ivory towers, so perhaps it’s only right that such groups involved. Plus, seeing as people don’t seem to want to pay fees or taxes for publicly funded science communication, maybe it’s only sensible the Science Museum et al ask groups who’ve made a lot of money out of science and technology give something back. We can’t just rely on moneybags of the Wellcome Trust (which has its own complex economic history anyway). As I’ve argued before, if businesses are going to have involvement in science education, I want to see what they think, warts and all. If groups like the Science Museum really have editorial control, they should take industrial sponsorship only if the company involved will also (a) give them their expertise, and (b) be happy for said expertise to be put under some scrutiny. Rather than retreat behind claims to scientific objectivity, science communication should wear it’s political fights on its sleeve, show science’s various institutional connections for what they really are. These sorts of debates are part of science in society and should be offered up and opened up for broader public discussion, appreciation and scrutiny. I’ve worked with a load of instituions in science communication, from Girl Guiding UK to the Royal Society, with a fair bit of industrial sponsorship thrown in at times too. This included stints at CND, Mind and the Science Museum while I was still in my teens. For that reason, I don’t think we should be scared about opening up debate on the politics of science at educational events aimed at schoolkids like the Big Bang Fair. I coped with these issues and think others can too. We should show them BAE, but make sure they get a group like SGR along to help offer other sides too. We should trust young people more when it comes to the messiness of science in society. This entry was posted in campaigning, climate, curriculum, education, engagement, museums and tagged climate science, education, engagement, events, industry, museums, science, science museum, sponsorship on April 12, 2012 by alice. Here’s the podcast for an event on the sounds of science I chaired at Charles Darwin House last week. The inspiration for the event was mainly just that I like making a noise. I also like listening to podcasts and I quite like science too. Moreover, I think that the noises made by and about science bring out some of the texture of scientific work, and let us reflect upon the stories we tell about science (things I think are worth doing). Our panellists covered audio-storytelling about science from polished BBC documentaries about instruction manuals (really, it’s great: go listen) to slightly rawer clips of spaceships launching (listen, put the sound up and watch your room shake). We also had an oral history of engineering, podcasts on Swine Flu for doctors to listen to in the bath and a bit of electronic music fashioned from the sounds of Tottenham Court Road. For me, the best bit came near the end when the audience started sharing memories of sounds made in the course of scientific work. Someone mentioned the way biochemists learn the art of recognising the right sound of a centrifuge when preparing cultures. One audience member mentioned the noise of telescopes (and you can hear this lovely Guardian podcast for some more on this), another shared her aural memories of working in anesthetics (there is a documentary in the sounds of surgery, I’m sure). A historian shared an amazing story about an artist he’d met who’d done some work on atomic weapon research sites, where she wasn’t allowed to take photos or write anything down but was (surprisingly?) allowed to record sounds. So she’d recorded the sound of the centrifuge which still gave a strong sense of place. I also remembered some stories of the history of atomic science, when it shifted from looking for particles to listening to traces of them, and young scientists would be employed because they had good ears rather than eyes and early radio enthusiasts had helped develop the technical kit required to do this research (this is only a sketchy memory of a talk from Jeff Hughes I once heard, sorry if I’ve got it wrong). I’ve been listening out to sounds around me ever since; thinking about ones I take for granted, finding new ones. This entry was posted in events, podcasts, science, web and tagged events, media, noisy, podcasting, radio, science, sound, web on March 5, 2012 by alice. 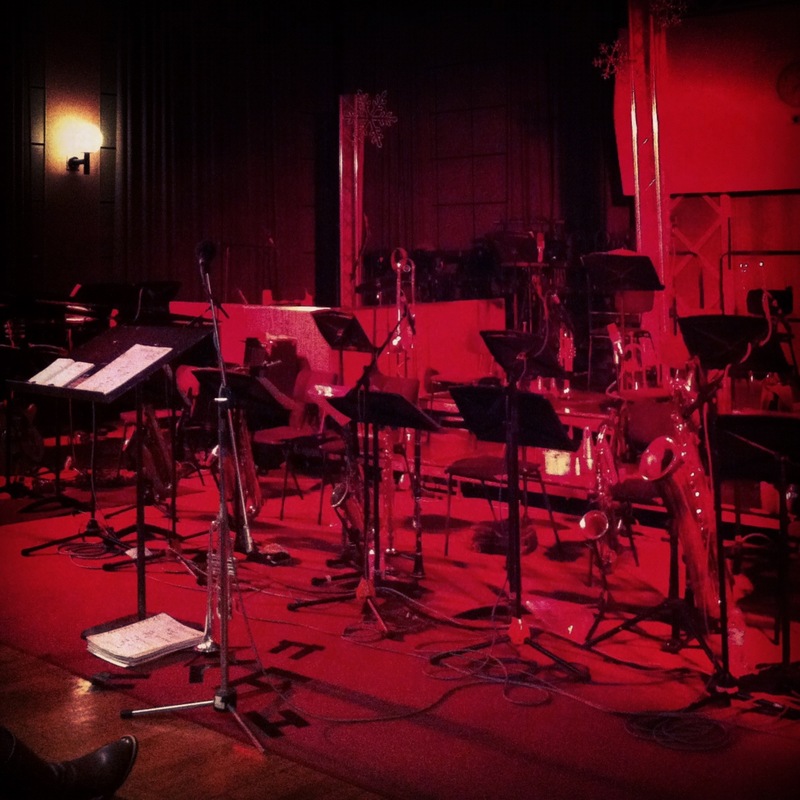 BBC Madia Vale Studios, before a recording last year. It’s world radio day! I don’t know about you, but I’m celebrating. I love the radio. I think I just like noise. Maybe it’s because my Dad was a musician. He usually worked from home, on what are probably best described as “musicians’ hours”, so there was a steady stream of odd bits of organised noise coming from his office. He was always very focused on the quality of sounds around him, taking personal offense to musac and swearing loudly every time the doorbell rang or a car horn beeped to interrupt the more controlled flow of noise around him. As an orchestrator, it was the particular sound any instrument made which interested him most, and he’d come home from a recording session full of stories of standing out the back of Abbey Road studios with percussionists hitting bin lids. I’m not a musician, but I seem to have picked up some of his obsession sound. I thought I’d take the opportunity of world radio day to advertise an event I’m chairing at Charles Darwin House next month on the sounds of science. Do come! There will be beer and cake and interesting people talking about the noisiness of science. It’ll be great fun. On the run up to this, I’ve been thinking about how I could share the noises of my research. I’m a humanities scholar so mainly just sit in an office on my own. There’s the sound of an email hitting my inbox I guess, or maybe the bell ringing from the tower outside my office at Imperial or people gossiping over a cigarette by the window I sit near at UCL. There is also a really cool whistling sound that happens on a windy day in the space between the engineering departements at Imperial. Some day I really must record that. Or the glass bridge at the Science Museum. It’s held up by piano strings so makes a slight sound as you walk across it. It’s usually too loud to hear in the museum, with all the visitors, but when I worked there I’d sometimes walk across it when the museum was closed, lean out to pluck a string and just listen. There are probably other noises around my work I don’t think about. I’m going to have to take time to think and listen. I also thought I’d share my top five listens in terms of science and technology; the podcasts I feel my week isn’t complete if I haven’t heard. BBC World Service Click – I’m not just saying this because the presenter has an office next door to mine at Imperial. The global perspective on technology it provides is simply fascinating. It’s something I don’t get from a lot of the other sci/tech media I consume, and really makes me think about technology in different ways. Like the Guardian tech podcast, I also find it invaluable as a briefing on media issues. Radiolab – It’s hard to describe quite how brilliant RadioLab is. Very simply, it is storytelling about science at its best. It will make you cry and laugh out loud in the middle of the street and you won’t care that it makes you look a bit weird because you are simply so absorbed in it. It is that good. Really. Guardian Science Weekly – There are a few science magazine radio shows out there, but this is my personal favorite. It updates me on the news and will add in the odd interesting feature and/ or interview too. There is a lovely chatty feel to it, a nice mix of humble and strident, and fun too. I’m also a huge fan of the Nature one, though it’s slightly more serious. Peter Day’s World of Business – This is maybe an odd choice as the focus of this is business, but perhaps because of this I find that when it does cover sci/ tech issues it does in a way I won’t find elsewhere. Plus, I just love the presenter’s voice and they once did a whole show about the history of pencils. In Our Time – Again, not always science, but rather the history of ideas, which often touches on science. The presenter can sometimes be a bit deferent to scientific expertise for my personal taste, but it’s usually a good clever chat about something interesting and often has Simon Schaffer on it (I’m happy to admit to being a huge Schaffer fangirl). The archive is prestigious. So, what are your favourite science and technology themed podcasts? I’d love to know. Also, do you work in a lab? Does your machinery, building or colleages make interesting noises? Maybe you could record it on your phone or something and share it? (Audioboo is good for this). Share your science noises! This entry was posted in audio, science and tagged audio, events, media, podcasts, science, storytelling on February 13, 2012 by alice.